Salvation And Survival: We Are The New Wine! We Are The New Wine! Well, hopefully you have had a chance to watch Torben Sondergaard's The Last Reformation. And I would really love to hear your comments about what you thought. I suspect there were some that were freaked out. After all, this is nothing like what you experience in your Church. And I'm sure there were others who were excited ... "This is what I've been looking for!" No matter which end of the spectrum you are on, I sincerely hope the movie created a genuine introspection on your part. As Christians, we can no longer avoid the uncomfortable conversation ... there is a growing schism among the Western Church. People who five years ago were comfortable "in the box" suddenly find themselves at odds with what they are coming to realize is a powerless Church. And they also find themselves in conflict with people [who are quite content where they are]; people who they've worshipped beside for decades. So more and more Christians are becoming dissatisfied with the status quo of the Western Church. And I would suspect that there are more than a few who are caught between those two paradigms ... out of the box, but not yet comfortable to let go of their traditions. Everyone's faith comes with attachments. And those attachments differ, depending on which religious traditions you embrace. But here is what we need to understand: Jesus wasn't promoting man's traditions. He came representing the Father, with a clear message to His Disciples of how His Father wanted the Gospel of the Kingdom advanced. The Disciples were to wait for the Holy Spirit to come upon them, and then baptize people in both water and the Spirit; healing the sick, casting out demons, raising the dead, and spreading the Good Word that all this is possible because our Father in Heaven wants to partner with us to bring Heaven to Earth. All that -- the works and the Gospel Message -- is all about POWER. The problem is that the Western Church has preached the Gospel [without the Power component] for so long, they are freaked out when they see it! The Western Church proclaims they have the correct knowledge of the Bible (in all their variations), but what we need is the obedience the Bible calls for. The Church has become a system. We even take tests to see what "gift" we have, or what "office" we should occupy. But if we look for a model, or instructions, on how Jesus told the Disciples to "do Church", it is the Church that sprang up in the Book of Acts. It is the only Book of the Bible that clearly shows the Disciples doing all that Jesus taught them while He was on earth. But how many of your fellow Christians do you see healing a sick person, then baptizing them in water, and then urging the Baptism of the Holy Spirit to come upon them as it did in the Book of Acts? Right now, some of you may be thinking, "But I'm not a Pastor. I don't have the authority in the Church to baptize someone". But we are called by Jesus to do it! Jesus came and said to them, "All authority in heaven and on earth has been given to me. Go therefore and make disciples of all nations, baptizing them in the name of the Father and of the Son and of the Holy Spirit, teaching them to observe all that I have commanded you; and lo, I am with you always, to the close of the age" (Matthew 28:18-20). Our traditions have reduced millions of Christians to sitting in a pew, or a class. They get taught and receive knowledge, but unless you go out to do "all that Jesus commanded us to do", you are not going to bear fruit or advance the Kingdom. So how much is that knowledge really worth in the Kingdom of God? Since we are not just supposed to be "hearers of the Word", how much does that model result in "doers of the Word"? So, the reality is that more and more Christians are awakening to the fact that Church as we know it is no longer satisfying to their soul and spirit. They are recognizing the Truth about what the Great Commission really is -- that it's more than sharing the Message of Salvation; more than Jesus dying to cover our sins. He died to remove our sins and to create in us a new man or woman -- one that bears fruit for the Kingdom by doing the things the Church in the Book of Acts modeled for us. And so they are leaving the traditional Church model and seeking ways to observe all that Jesus commanded those Twelve Disciples. But here is a warning that I want to give... Yes, Christians are breaking free of the powerless Western Church, but there's one thing we must guard against. The challenge when we leave "the box" is not to create the same thing we just left! How does it advance the Kingdom if we teach the same way and act the same way? If we never actually become that new wine that can't be contained in the old wineskin? How can we expect to get new results by continuing our old behaviors? 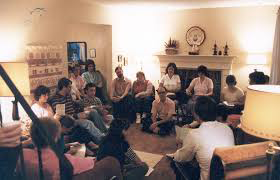 As one commenter posted, "House Churches can be just as dead as those who gather in "the box" ". As we get closer to Jesus's return, we are going to see a split in the Western Church. One side thinks we have evolved beyond the actions of the Disciples in that First Century. They think that laying on hands to heal the sick, delivering a Christian from demonic torment, or baptizing in the Spirit is not for today. We are to submit to the authority of the Pastor and the Church system. The other side has been awakened to the power of the Holy Spirit in the Believer [to bear much fruit for the Kingdom] and they want to see the Body of Christ become the Church Jesus intended it to be. The bottom line is this .... I don't care if a Christian goes to a 5,000 member mega-Church, or is part of 20 devoted Believers who meet in a home. If there is no fruit being produced by either group, then the Holy Spirit is not present. And when the Holy Spirit is absent, there is no power to fight the spiritual battle against the sinful nature of this world. And that is not what Jesus had in mind for His Church. Yes, we receive the Holy Spirit the moment we believe in Jesus Christ as our Savior. But I want the Fire of the Holy Spirit. Remember that John the Baptist said He baptized with water, but "He [Jesus] will baptize you with the Holy Spirit and with fire". It was that fire that changed the world; that needs to change the world today. 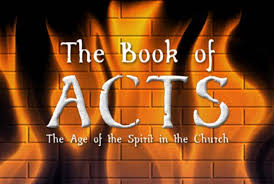 God poured out His Holy Spirit with fire and signs, healings, and spiritual gifts on the Church of the Book of Acts. He knew if the Early Church was going to survive the horrific attacks that would come against it, Believers would need the spiritual power of the Holy Spirit to counter those attacks and advance His Kingdom on earth. He has awakened us in the 21st Century Church to the same truth. We need the joy of being filled with the power of the Holy Spirit to counter the ambivalent, compromising, and weak institutionalized Church. As we begin to walk out the power that the Book of Acts Church modeled for us, we will see God renewing us; restoring us; and equipping us to do the works Jesus did, and even greater works -- all with the advancement of the Kingdom on earth in mind. This is an exciting time to be a Christian ... let us walk in the footsteps of those Early Disciples and see the True Church established in power and obedience to Jesus's commands upon our lives. Let us be like the new wine ... so alive with our conversion from the powerless Church that we can no longer be contained in the old vessel. There is reformation and revival brewing in the Church. That is the legacy left to us by the Church in the Book of Acts. It's time we picked up the mantle! People who aren't Lutheran don't take partaking in the "body and blood" literally? By the way, I always felt that was a bit disgusting if you take it literally, but my past could never really explain it. It is not a disparagement of the Lutheran doctrine, it is just one of the ways that "the Church" has been divided over doctrines and traditions. We need to get back to the Church of the Book of Acts and follow Jesus's commands to us. I am going to watch this movie tonight! I saw the trailer and I can relate to your passionate questions because I have been asking this question (of why the church of today does not resemble the church of Acts and shouldn't we want that?) of my spiritual leaders for most of my life and they cannot answer my questions because, I believe, of a fear of the Holy Spirit doing the things He did at Pentecost. Not to mention a fear of experiencing serious persecution or bodily harm! Since receiving the Holy Spirit many good things have happened and I am encouraged that this is exactly what God intended. God bless you in your pursuit of Him. I am so excited for you to see this movie! Please come back and comment after you've seen it --- and don't quit asking those questions of your Church leadership! And perhaps you will be the one to take this message to your Church and start a reformation!!! Yes, I watched The Last Reformation, and then went on to watch https://www.youtube.com/watch?v=W-n6SJJHpb8 7 Days Adventure With God. It was just as awesome as The Last Reformation. By the way, if you watch the 7 Days Adventure with God, you'll see Torben actually prophesy when he is praying for a woman on the last day of their trip. It's beautiful. I was raised in a Pentecostal church so I'm used to services with prayer in tongues, Prophesy, etc. However, what I didn't see too much of back then were people getting healed and demons being cast out. My testimony, briefly, is that I didn't stay in the church and was in my mid 30's before I got saved. I started going to a church where I received some good foundational teaching, but one night I came home from church feeling dissatisfied. I had a heavy burden on my heart like there was more that I was missing out on. After my family went to bed, I got down on my knees and poured out my heart to God. He gave me this "vision" I guess you could call it. I was standing on this plane, a flat surface somewhere off earth that went on for a long distance, with two extremely tall angels standing on either side of me. A third angel reached inside me and pulled out something and cast it over the end of this plane into darkness. That was the end of the vision, and immediately after, I started speaking in tongues, and I have been ever since. I don't know if you have experienced it yourself, but it's like what one of those guys described in the video. The Spirit takes over your tongue and as you're praying, the words become His and you're listening to these foreign words coming out of your mouth, and you're still able to think separate thoughts in English. It's amazing and it is definitely edifying. The peace God blesses you with after is even more beautiful. No one can tell you this is not from God, because why would the devil give you such peace? Only God can do this. Anyway, I've recently had such a hunger in my heart for more and all I can say is that God has been drawing me in the same direction as you as far as living out the Christian life like they did in the book of Acts. I would love to attend one of those Kickstart weekends but I don't live anywhere near the places Torben is going. So, I'm just starting the lessons and praying that God will put me on the right path with this. It is never too long when you are revealing the heart of God, which I believe you just did! Yes, I have been seeking the Baptism of the Holy Spirit for a long time, and received it while watching that movie. I wept in true repentance (I have repented for my sins in the past, but this was different -- I wept for grieving God in my sin) and the language I spoke had been on the tip of my tongue for awhile, but now it flowed and I wasn't afraid to use it. I felt a swelling in my chest that I knew was the presence of the Holy Spirit and the Living Water overflowing my heart. I was so overcome with the Presence that all I could do was weep and be enveloped by it. Since then, I know there is more to come... and that I want more -- that the Holy Spirit wants to keep filling me up and I want more of His power so I can share it with others. We have shown this movie to several groups and we are coming together to buy a baptism font to begin baptizing people that we are going to lead to the Lord. I, too, want to become the Church of the Book of Acts because it is what the world needs! There is a group of us who are going to do Torben's Pioneer School together, and my husband and I have watched the 7 Days Adventure With God movie, as well. All this is good! Also, check out his Cafe Talks on YouTube. They are awesome, as well. Thank you so much for sharing your testimony. I know it will inspire others! I love that you shared your testimony with us! It is awesome to see how other people were placed on the path to Kingdom work. Sorry but I know several people who are in or have come out of the Lutheran church and they all profess the body and blood are real sacraments! I think you misunderstand my point ... it is not a question of whether Communion is a sacrament in the Lutheran Church. Of course it is! As it is in all denominations. The difference in Lutheran doctrine is whether the sacrament REPRESENTS the Body and Blood of Christ or if it is the ACTUAL Body and Blood of Christ. Belle,I'm convinced more than ever that the breakout that's happening right now is the new wine church! The religious mainstream church is no more his church than the new age church or Mormonism is his church. No doubt he wants all these folk's saved but I reject any notion that anything but the remnant is his actual church. The mainstream church preaches a different gospel and does a diluted Mark 16 and refuses to make disciples in any resemblance of Yeshuas instruction! Prosperity gospel,seeker friendly gospel,emerging church! None of this is his instruction and isn't in the Book. Even the church that tries to deliver a sound doctrine won't go out and do Kingdom as Yeshua described it to the 12. We are the new wine and I for one have no intention of being crammed back into that old wine skin called "church" They don't want new wine in their building anyway! Blunt and to the point ... but I have to agree with you. I know many might be offended at your theory that only a remnant will be the True Church, or that their Church is a compromised one. But all one need do is look at the fruit of their Church ... Are they training up Disciples to go out and heal the sick, cast out demons, share the Gospel of the Kingdom, and baptize new believers? If you are not doing that, can you say you are really doing the Commission left for us? Those were the "works" Jesus said we would do -- and even greater ones! Belonging to a denomination, or sitting in a particular building every Sunday is not the criteria Jesus commanded to be His Disciple. Those who adhere to those standards might be Saved, but they are not Disciples. There is to be more to our Christian experience than salvation.